During the early 1940s, the focus of comic books shifted more toward true adventures versus tales that offered an escape through fantasy or followed the antics of superheroes and detectives in their fight against evil. Many of these true adventure comics provided what could be considered illustrated biographies of heroes and role models in science and medicine from that time and throughout history. 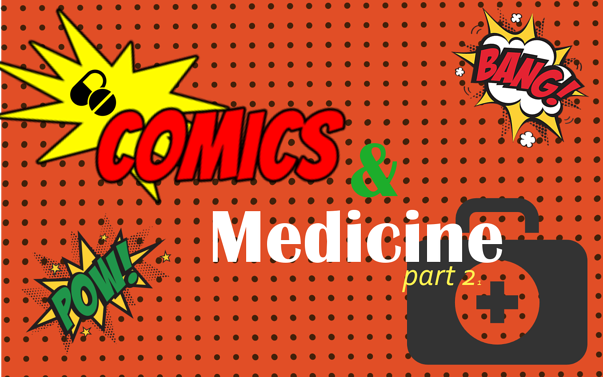 The “golden age” of American medicine began around the 1940s, which coincidentally was also considered the golden age of comic books. In the United States, doctors held a high social status and people were coming around to accepting modern cures without as much skepticism, as medicine was now able to prevent or cure certain conditions. Comic books with the names Real Life Comics, True Comics and Real Heroes competed against Batman and Superman comics for the attention of young readers. This new breed of comics featured stories about Dr. Joseph Goldberger who fought famine, Louis Pasteur and Florence Nightingale — heroes whose stories might only be glanced over briefly in a school history book. The publication of True Comics began in April 1941 with the motto: “TRUTH is stranger and a thousand times more thrilling than FICTION.” Stories of heroes in medicine appeared alongside stories of war heroism with Dr. Walter Reed’s story about conquering yellow fever being featured. The appeal of this genre of comics was so strong that the comic soon turned to being a monthly publication. By 1942, True Comics also became a newspaper comic strip that ran for several years. By the end of 1941, a new slew of true comics were debuting. Calling All Girls was a biographical comic that was geared toward stories about women who were heroes. However, by the end 1942, the fictional Wonder Woman comic began and included a two- to four-page section that focused on real “Wonder Women of History.” This section focused on telling the true life stories of women who were famous as pioneers in nursing, medical research and public health. The interest in true life comics began to die off after World War II. However, during the early 1970s, Marvel Comics introduced Night Nurse, the alter ego of Nurse Linda Carter. Night Nurse began showing up in other comics — including Daredevil — not as a superhero, but as a nurse who helps injured superheroes. The character has received new life and is now known as Claire Temple, who can be seen in Netflix action shows such as Daredevil, Luke Cage, Jessica Jones and Iron First.